With the recent controversy over TransLink and Metro Vancouver, it has become apparent that there is broad confusion over which level of government or agency delivers services to people in our region. 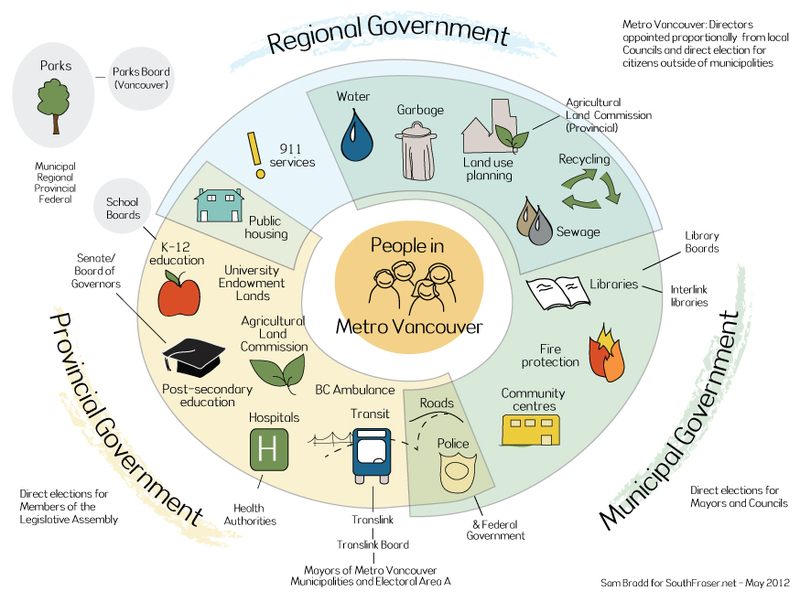 To help people understand the complexity of service delivery in our region, OnTrax partnered with local graphic artist Sam Bradd to develop an infographic that shows who is responsible for delivering services to people in the region. 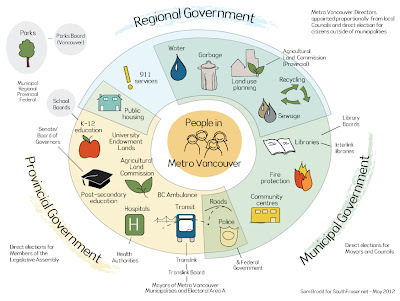 Infographic – Government Service Delivery in Metro Vancouver. Click Image to Enlarge. What becomes apparent when looking at the infographic is that there is a large degree of overlap in service delivery. It shows how our region is really based on cooperation and that all levels of government share the responsibility in providing services to people in Metro Vancouver. The infographic also shows that the federal government plays a very limited role in the direct delivery of “on the ground” services that people rely on daily. Parks are the one service that all levels of government support directly, which shows the importance of green space for Canadians. Download a PDF version of the infographic from our document archive. The infographic is released under a Creative Commons Attribution 2.5 Canada License. Thanks for the feedback! The challenge was to provide enough information without making the graphic unreadable. The first draft of this was very confusing and we had to a lot of fine tuning.